How can we think of space in the digital age? This project aims to explore this issue by proposing both theoretical and practical lines of reflection. 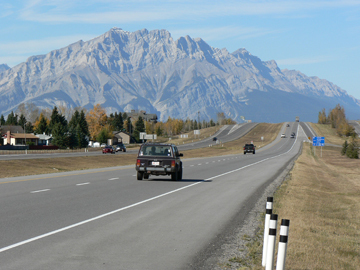 The mythical space of the Trans-Canada Highway will be just as much the field of study as the field of exploration for our research. The Trans-Canada Highway, the legendary road that crosses Canada from the west coast to the east coast, has resulted in a series of media productions: literary stories, images, videos, maps, historical texts, and digital data (digital maps, Wikipedia files, etc.). In May 2016, our research lab (Theolinum, a Canada Research Chair on Digital Textualities lab) will cross Canada along the Trans-Canada Highway to add our own travel experience to all of these mediations. The question we want to ask is: What is the nature of this space? What does it represent and how do we think of it? Indeed, today, the first reflex is to search all of our information on the web, which includes historical information, images, stories, and also maps. Thus, this relatively empty space on a traditional map, when experienced both physically by travel and in a mediated way by the web, quickly "fills" with a series of values, symbols, and cinematographic references, as well as literary, historical, and patriotic narratives. The question that animates us is then: would it be possible, to borrow the idea of Perec who tried the experiment in Paris, to exhaust this space that is both geographic and imaginary of the Trans-Canada? On a more theoretical level, what would this exhaustion mean? Would it indeed be a form of hyper-representation - an account of the minutest details of what is factually in this space - or, on the contrary, an activity of production of a reality? To answer these questions, we propose to reveal the Trans-Canada space by questioning it on several levels. On the one hand, we will experience it through a car trip from Montreal to Calgary. We will also document and tell our journey through a series of digital tools (writing online, photos, videos). The hypothesis that we want to demonstrate is the following: the digital is as much a tool of representation as it is a production of the space. It seems to us undeniable, indeed, that our vision and experience of a territory such as Trans-Canada - as well as our way of organizing it by writing it - are deeply structured by digital tools and their layouts: the different sources, the interactive maps, and all the information, data and documents that we find on the web. In other words, our way of thinking about this space and considering it involves the mediation (often unconscious) of the tools that map it, describe it, and tell it by filling it with images, stories, and information.